ORLANDO — A nostalgic Robert S. Mueller III addressed the International Association of Chiefs of Police Annual Conference (IACP) here on Monday for the last time as FBI director as he finishes up his 10 year term, which ends next fall. 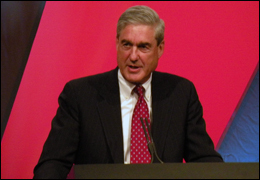 “My first IACP conference took place seven weeks after September 11th,” Mueller told the crowd. “There was much discussion that year about whether to even hold a conference. Many of you did not want to leave your departments in a time of crisis. “In the end, you chose not to allow the events of that day to stop you from doing what needed to be done,” he said. And he emphasized the increasing importance of cooperation among law enforcement in the states and internationally. Posted: 10/25/10 at 6:20 PM under FBI, News Story.